Summer light filtering through green leaves. The moon reflected on a clear lake. Mount Fuji covered in cherry blossoms. Throughout history, these quintessentially Japanese images have been painted, written into poems and painstakingly made into miniature artworks that are briefly admired, then eaten. Before Pocky, and before KitKat, Japan had wagashi. 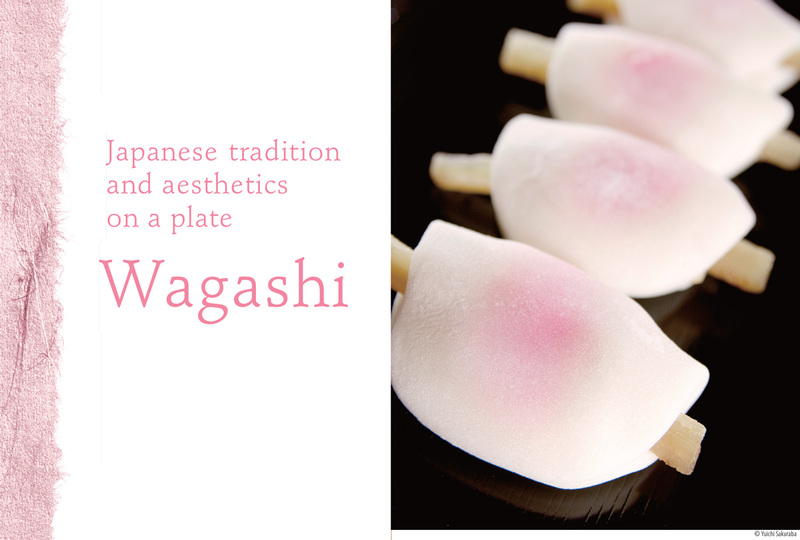 Literally “Japanese confections”, wagashi includes familiar favourites like mochi rice cakes, dango, and manjuu, many of which can be found in Japanese grocery stores in Australia. 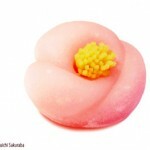 But for the cultural explorer who dares venture beyond the usual tourist traps of Japan, the essence of wagashi awaits. During the Edo period, in the ancient Japanese capital of Kyoto, wagashi developed from simple fruits and snacks into highly intricate sweets. These sweets became a key component of the Japanese tea ceremony, to be served alongside matcha green tea. As the tea ceremony is intimately connected with seasonal themes, the host carefully chooses elements that herald the arrival of seasonal changes. The wagashi served reflects this awareness of seasonality, shaped and poetically named to evoke flowers, leaves, fruits and natural scenery. This sense of connectedness with nature is true down to the ingredients, which tend to be plant-based and seasonal – wagashi served in spring, for example, may be sakura-flavoured due to the availability of sakura leaves, while chestnut-based wagashi are common in autumn. Just as the tea ceremony represents the key aspects of Japanese culture, the wagashi’s shapes, colours, ingredients, scent and texture come together in an embodiment of Japanese aesthetics, acting as a bittersweet reminder of the passing of time. The wagashi associated with the tea ceremony are often called jogashi, of which there are three types: namagashi, hannamagashi and higashi. Namagashi, specifically the hand-shaped nerikiri, are the beautifully crafted confections that most people think of as wagashi. Made from a mixture of bean paste, sugar and rice dough, they are extremely perishable and are usually eaten on the same day. In summer months, agar-agar and kudzu are used to create namagashi that include transparent jelly parts, creating a visual appearance of coolness. 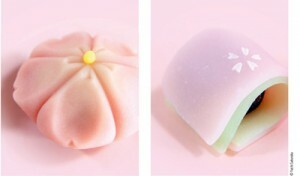 Less fragile are hannamagashi, soft sweets with lower levels of moisture that allow them to remain fresh for longer. Yokan, a well-known type of hannamagashi, are blocks of red bean paste, sugar and agar-agar which are sliced for serving. The third type of jogashi, higashi are dried sweets which include rakugan, a mixture of rice flour and powdered sugar which are pressed into moulds to form seasonal shapes. 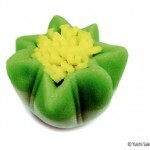 Besides their role in tea ceremonies, wagashi are tied to the Japanese customs of gift giving. Hanabiramochi (Flower petal cake) – white and pink rice cakes flattened into thin circles, layered onto each other, then folded in half. Wrapped up inside are miso-flavoured bean paste, and sticks of sweet boiled burdock. Sakura mochi – a sweet pink sakura-flavoured rice cake wrapped around red bean paste, and then itself wrapped with a pickled sakura leaf. 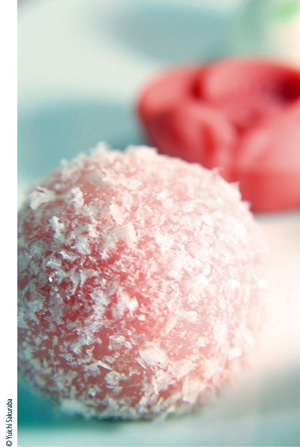 Hishi mochi – a diamond-shaped rice cake consisting of three layers of red/pink, white and green. Kashiwa mochi – red bean paste in a white rice cake, served wrapped in an oak leaf. Some areas of Japan may fill the rice cake with miso-an white bean paste. Chimaki – a sweet glutinous rice dumpling wrapped in bamboo leaf, then steamed. Ama no Gawa (Milky Way) – ingredients and designs vary according to the confectionary maker, but this is usually a jellied sweet with colours and motifs to reflect the Milky Way stretching across a night sky. Kyoto, the historical and cultural home of wagashi. Experience wagashi as originally intended, within the serenity and context of the tea ceremony. Paired as a counterpoint to the bitter matcha, the combination is sublime. For a less formal atmosphere, visit the artisanal wagashi stores. Many of these stores have long, distinguished histories and some feature cafes where you can enjoy their wagashi with tea. Tsuruya Yoshinobu: On the second floor of this sweet shop in Kamigyo, Kyoto, visitors can observe a wagashi maker in action, demonstrating and describing the process for making seasonal namagashi. Predominantly Japanese language only. Toraya: founded in the early 16th century, Toraya is one of the oldest and most famous of wagashi institutions. It has tea rooms and shops in Kyoto, Tokyo, and Shizuoka. Yatsuhashi: a well-known shop for yatsuhashi. This triangular confectionary of rice dough, sugar and cinnamon is associated with Kyoto and is a popular souvenir item. If you’re more the hands-on type, you can get the whole immersive experience by taking a short class on making wagashi. Kanshundo: in this 150 year old shop in Kyoto, a skilled artisan will show you how to make uiro (a steamed cake of rice flour and sugar), nerikiri, kinton and higashi. Of course, once you’re done, you can enjoy your finished sweets with matcha.